Often time a rug or carpet shampoo is only safe for a particular type of textile. Be sure that the shampoo you are using doesn’t damage oriental rugs, Persian rugs, silk rugs and wool rugs, as these kinds are delicate. You should not use strong detergents and solutions when cleaning it. It would be best to know the right substances to use when cleaning these kinds of textures. It’s ideal to use a vacuum cleaner when removing dust. However you should be careful not to damage the textile when doing it. It would be better to use the high setting of the vacuum cleaner on the back side of the carpet. Don’t set the vacuum cleaner on high setting if you’re using it on the top surface. The vacuum cleaner could damage the surface. Make sure that you carefully vacuum the surface that needs vacuuming. If someone accidentally pours a liquid that causes stains to your carpet then it’s advisable to clean it right away. It’s better to do the rug cleaning when the stain is still soft and not dried up. It’s hard to remove stains that are dry and have been there for quite some time. It’s best that you wash the stain with hot water before you apply any solution. 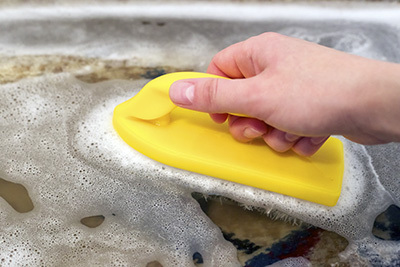 Hot water can soften the stain and will make the cleaning easier.